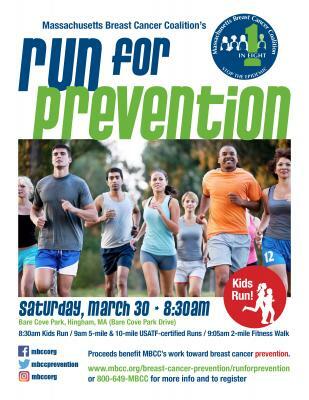 Massachusetts Breast Cancer Coalition (MBCC) invites runners, walkers, and families to register for the inaugural, Run for Prevention on Saturday, March 30, 2019. The event will take place at picturesque Bare Cove Park in Hingham, MA, located along the banks of the Weymouth Back River and features USATF certified 5- or 10-mile run, 2-mile fitness walk, and 1-mile kids fun run. 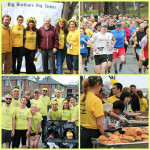 Registration is $40 for the 10-mile run, $35 for the 5-mile run, $25 for walk participants and $10 for the kids fun run. 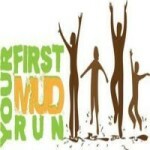 Prizes will be awarded to the top finishers in the 5 and 10 mile runs. Event-day registration will begin at 7:00 am near the parking lot at the end of Bare Cove Park Drive. Participants are invited to join a free yoga and meditation class from 7:30 – 8:00 am hosted by Kim Dwyer, certified C-IAYT yoga therapist, meditation and yoga teacher and Trish Hart, Therapeutic Yoga and Meditation Instructor and Stress Management Specialist, from Center for Integrative Counseling and Wellness in Hingham, MA. Yoga mats are suggested by not required. This will be followed by a dynamic and functional warm-up held at 8:05 am with Matt Johnson, owner of Energy Fitness and Gymnastics of Newton and Natick. Run for Prevention will begin at 8:30 am with the kids fun run, followed by a 9:00 am start for the 5 and 10-mile runs and a 9:05 start for the walkers. Parking and the event starting line are located at the end of Bare Cove Park Drive, near the South Shore Model Railway Club & Museum. How to Find Start Line: Parking and the event starting line are located at the end of Bare Cove Park Drive, near the South Shore Model Railway Club & Museum.